Reading in a Second Language sets the testing and teaching of reading against a theoretical background, discussing research from both applied linguistics and cognitive psychology. 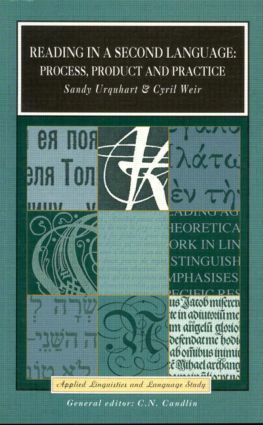 Where possible, it focuses on research into second language readers and distinguishes different kinds of reading, particularly expeditious as opposed to careful reading, and emphasizes the validity of each.Sandy Urquhart and Cyril Weir relate testing and teaching, discussing similarities and differences, providing a comprehensive survey of both methods with the emphasis on those which have been substantiated or supported by research evidence. Finally, the book proposes specific research topics, and detailed advice on how to construct tests of language for academic purposes and suggestions for further research. 4.4 What Should Happen in the Reading Classroom?